On March the 4th Dutch leader of the right-wing Forum for Democracy Thierry Baudet reacted to a statement by liberal politician Rob Jetten about homophobia in The Netherlands. 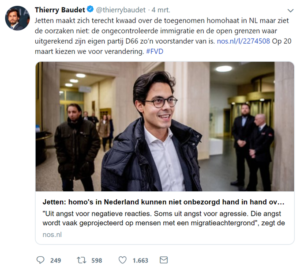 Baudet stated on Twitter: ,,Jetten’s anger about the increased homophobia in The Netherlands is justified, but he doesn’t see the causes: the uncontrolled immigration and the open borders his own political party D66 in particular stands for.” His claim about the causes for the increased homophobia is false. In this factcheck we focus on the statement that ‘the uncontrolled immigration and the open borders’ are the causes of the ‘increased’ homo-hate crimes in The Netherlands. It is important to notice that Baudet doesn’t speak of any specific time or place. This is why we assume that he is talking about the general situation in The Netherlands in recent years. Baudet reacted to quotes in a lecture by his fellow Member of Parliament Rob Jetten, as reported by national public broadcaster NOS on 4 March. Jetten voiced concern about the emancipation of the LGBTQ-community in the Netherlands. He didn’t mention any increase of homophobia. Because Baudet’s statement isn’t specified, checking it is difficult. To still be able to check his statement, we used several research reports about the nationality and ethnicity of suspects of homophobic crimes. Besides that, we also checked whether or not homophobia in The Netherlands has really increased. The Netherlands Institute for Social Research (SCP) published a LGBTQ-study in November 2018. This study mainly concentrates on the living conditions of homosexual, bisexual and transsexual people in The Netherlands. An important statement reads: ,,Recent studies indicate that the attitude towards LGBTQ-people has become more positive between 2006/2007 and 2016/2017 (Kuyper 2018).” For this, the SCP used data of the Safety Monitor that is published by the Central Bureau of Statistics. Besides LGBTQ-people feeling more safe throughout the years, they also mentioned having less experiences with homo-hate crimes. To conclude: the statement about the increased homophobia in The Netherlands is generally untrue. Bisexuals did mention a slight increase in experiences with homophobic crimes, but Baudet did not specify that. In 2015, the Dutch police published a study about homophobic crimes in The Netherlands. A notable fact: about 60 percent of the reported incidents took place in Amsterdam. The study doesn’t differentiate between non-immigrants and immigrants, but it does look at the nationality and birth country of the suspects. This study proves that 61.8 percent of the suspects has the Dutch nationality. To quote the study: ,,In 16.6 percent of the cases the suspect has the Moroccan nationality (possibly combined with the Dutch nationality). Besides that, 5.5 percent of the suspects has the Turkish nationality and 2.5 percent has the Romanian nationality. The nationalities that are even less frequent aren’t specified. In 11.5 percent of the cases it concerns a nationality that occurs less than four times.” In conclusion: the uncontrolled immigration and open borders are not the main causes of homophobia in The Netherlands. A different study from The Netherlands Institute for Social Research mentions the following: ,,The acceptance of homosexuality can be a sensitive subject for Syrians: less than a fifth fully or partly agrees with gay marriage. About half fully or partly agrees that the homosexuality of a child is problematic.” The study does prove that Syrians who have been in The Netherlands for a longer time have a more open attitude towards homosexuality. Laurens Buijs from the University of Amsterdam published a study about the same subject in 2009. He proves that 36 percent of the suspects is of Dutch descent and that another 36 percent of the suspects is of Moroccan descent. This study shows that suspects of homo-hate crimes are just as much of Dutch descent as of Moroccan descent. To conclude: homophobic crimes aren’t caused anymore by ethnical minority groups than by people with the Dutch nationality. Thierry Baudet’s statement about the uncontrolled immigration and the open borders as the cause of the increased homophobia in The Netherlands is false. This is mainly so because homophobia in The Netherlands hasn’t increased at all. Besides that, the studies above prove that the suspects of homophobic hate crimes are mostly people with the Dutch nationality.